In Lewis Carroll’s Alice’s Adventure in Wonderland, young Alice finds herself in a fairytale world, where whimsical characters guide her in a magical journey of self-discovery. Much like in Carroll’s story, the Mississippi Children’s Museum (MCM) in Jackson, Mississippi, whisks children into a land of wonder and endless possibility. With its opening in December 2010, MCM began its quest to provide experiences that ignite a thirst for discovery, knowledge, and learning in children across the state. In the eight years since, MCM has pushed beyond its walls, broadened its reach, and inspired lifelong learning in communities across Mississippi. The museum has found success in reaching local and state residents in a variety of ways, and was named an IMLS National Medal finalist in 2017. Part of pushing those boundaries was finishing a planned outdoor space: the Literacy Garden. “The primary goal for the garden’s completion was to enhance the place-based education we could offer at the museum,” said Susan Garrard, President of the Mississippi Children’s Museum. 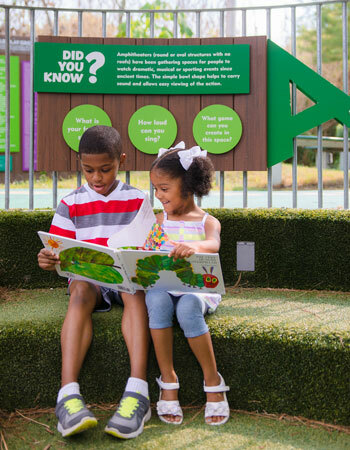 With help from an IMLS grant, the museum embarked on the third and final phase of the Literacy Garden in 2014, expanding the museum’s capacity to offer innovative educational experiences for Mississippi’s youngest residents. Beginning on the Topsy-Turvy Pathway, children and their caregivers are guided through a world of storytelling. Whether watching the Dancing Waters Wordfall, discovering the Rhythmic Sound Story Sculptures, climbing the Tall Tale Treehouse, or finding themselves under one of the garden’s electronic fairytale mushrooms, which offer storytelling experiences and teach active listening, the garden offers something interesting for everyone. The 6,500-square-foot outdoor Literacy Garden draws inspiration from nature centers, children’s gardens, reading programs, and playgrounds. 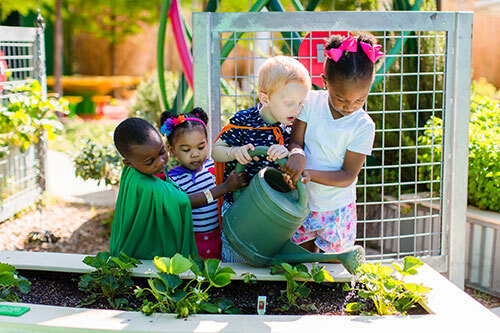 A new model for outdoor children’s spaces at museums, the garden addresses the critical and profound need in Mississippi for early learning resources that emphasize literacy, language development, and outdoor play. MCM had help along the way, as staff took a community-based approach to the design of the outdoor garden. The museum partnered with Native Habitats, the art and design firm NunoErin, Mississippi State University Department of Landscape Architecture, and University of Mississippi Department of Education faculty to thoughtfully create a place to support kids’ cognitive growth and the development of their physical, social, emotional skills. One of the important aspects of the garden is encouraging caregivers and parents to be active participants in their child’s educational journey. Questions, poems, and “Did You Know” facts are sprinkled along the path, and propose learning challenges rather than provide overt instruction. 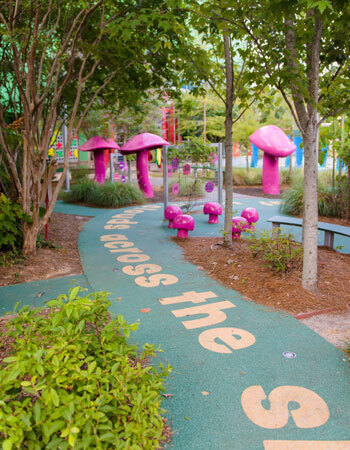 The role of outdoor play can be seen in the whimsical adventures provided by the garden’s programming. 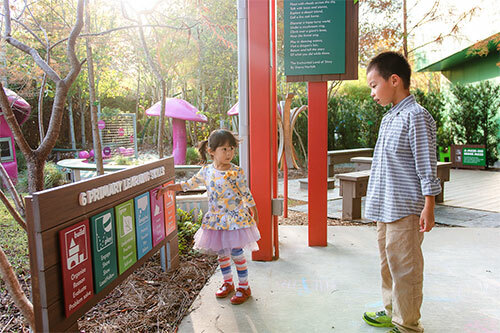 Kids can explore the literary themes of the garden by connecting with a book, story, poem, or language activity discovered along the path. Some of the garden’s most popular programs include “Know to Grow,” butterfly releases, and Friday farm programs, where edible gardens become part of the museum experience. MCM also developed environmental education and field trip programs, as well as a variety of professional development workshops for educators that correlate with garden themes of STEM and literacy. All programs are designed to emphasize the beauty of nature and the importance of stewardship when interacting with outdoor spaces. The garden also needed to be accessible to low-income and underserved populations that reside in Mississippi, supplementing the education that children receive in school while also making it fun, engaging, and inspiring. The garden’s foundation lies in six words: build, play, grow, imagine, create, and explore, which are all tied together by a poem written by Sherry Norfolk of the Mississippi Arts Commission. The garden’s design supports a wide variety of educational abilities and levels, and it’s also ADA compliant. Throughout, the garden also features a variety of hidden sections where children can find safe, quiet spaces to learn without crowds, noise, or pressure. “The Literacy Garden continues to be an inspiration as we think of different ways to enrich our education activities for Mississippi’s youth,” said Gerrard. The space has become the inspiration for the museum’s pollinator garden, which uses the same inquiry-based framework on which the garden is constructed. While MCM continues to look for ways to build their capacity to offer new, enriching experiences, they also continue to look for ways to share lessons learned about outdoor spaces as a component of museum experiences. MCM recently presented on these best practices at the Association of Children’s Museums’ annual conference, InterActivity, in Raleigh, North Carolina. As children continue to explore the wonderland of the Literacy Garden, the hope is that they’ll discover the magic of learning. 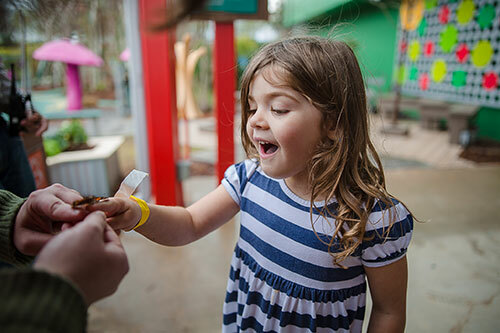 Alice, after a books’ worth of strange and wonderful adventures, remarks, “Those who don’t believe in magic will never find it.” Luckily, visitors to the Literacy Garden have it right at their fingertips.